Daled Amos: Mideast Media Sampler 10/27/13: Have We Forgotten Iran Has Been At War With The West For 30 Years? Mideast Media Sampler 10/27/13: Have We Forgotten Iran Has Been At War With The West For 30 Years? Calling the conflict over Iran’s nuclear program “unnecessary” is hardly conciliatory. It’s absolutely contentious. Remember that Zarif has been hailed because of his Western background. Surely he knows the implications of different words. He didn’t call his presentation an “unfortunate” crisis, which would suggest a misunderstanding. “Unnecessary” is a slap at the United States and the West for not trusting Iran’s intentions regarding its nuclear program. That is problematic on two counts. The first is that it presumes that there’s no reason to suspect that Iran has been sneakily been inching its way towards a nuclear weapons. The latest ISIS report estimates that if Iran chose to make a bomb it could conceivably enrich enough uranium for a nuclear bomb in a month’s time. But it also assumes that the nuclear issue is the only point of contention between Iran and the West. It isn’t. 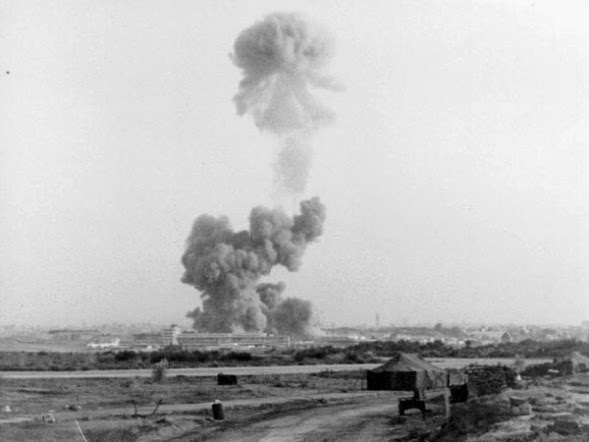 Last week was the 30th anniversary of the Marine barracks bombing in Beirut. That anniversary should remind us of Iran’s enmity of the United States. To be sure President Obama said many of the right things when he commemorated the attack. Thirty years ago today, 220 Marines, 18 sailors, and 3 soldiers lost their lives to a Hizballah suicide bomber who attacked the Marine barracks in Beirut, Lebanon. Minutes later, 58 French paratroopers lost their lives when a second Hizballah suicide bomber attacked the French barracks. This despicable act of terrorism was the deadliest single-day death toll for the U.S. Marine Corps since the World War II Battle of Iwo Jima. Our Marines and their fellow service members were serving in Beirut as part of a multinational force during the Lebanese civil war, to help bring stability to a troubled region and to defend our strategic interests in the Middle East. They came in peace. However, it wasn’t just Hezbollah behind the attack. Not only was it one of the deadliest attacks against the U. S. Marine Corps, it was a huge explosion, possibly the largest non-nuclear explosion in history. This wasn’t happenstance or coincidence, it was decisive enemy action. The resources and logistics to pull off an attack like that were significant. And they were provided by a government: Iran’s. Despite the current charm offensive of Iranian President Hassan Rouhani — and suggestions by some that the Islamic Republic is moderating its stance — it is highly unlikely that Iran will ever give a thought to reining in Hezbollah. But Hezbollah isn’t run by some rogue organization within the Iranian government. It is run by Iran’s Revolutionary Guard Corps, whose leaders, even now, are powerful figures within Iran’s government. That includes current leadership in Tehran. Retired Col. Tim Geraghty, who commanded the international peacekeeping mission and the 24th Marine Amphibious Unit that lost 220 Marines that day, said Brig. Gen. Hossein Dehghan, the new Iranian defense minister, is the former Iranian Revolutionary Guard commander who helped oversee the attack. Geraghty spoke at a remembrance ceremony at Camp Lejeune in Jacksonville, N.C., on Wednesday. “The past three Iranian ministers of defense, including the current one selected a few months ago, all have peacekeepers’ blood on their hands and are leading the Iranian lockstep march for the acquisition of nuclear weapons,” Geraghty said. Remember that the next time you read about how “moderate” President Hassan Rouhani is or how “western” Iranian foreign minister Javad Zarif is. Rouhani appointed a minister who escalated a thirty year war against the United States. The substance of that action is more significant than moderation in Rouhani’s tone. After the bombing, a debate took place within the Reagan administration as to how to respond. The leading advocate for vigorous retaliation was the secretary of state, George Shultz. The defense secretary, Caspar Weinberger, argued against any further entanglement. Weinberger prevailed. President Reagan, who had told the world the United States would never back down to terrorists, did exactly that when he pulled everyone out four months later. The desire to consummate a deal with Iran regardless of its previous subterfuges in its nuclear dealings and regardless of its ongoing war against the United States is disturbing. Today Hizbollah is stronger than it was at the start of the last war with Israel. Iran, more bellicose than ever, not only pours more money in but leaves no question as to its desires and goals. Yet we ignore their words, and worse, excuse them. We neither speak, see, nor hear any evil from those who name us enemies. It’s insanity. Today I remember those friends lost way too soon. I’ll also pray that no more are taken from us… but if some are, I’ll pray that we find the resolve to confront and defeat those who have so long and continuously sought to destroy us all. Are our leaders so focused on making a deal that they will ignore the nature of the Iranians sitting across the table from them? The gullibility of Mr. Obama’s pursuit of an opening with Iran has unsettled America’s allies in the region. In Jordan, Saudi Arabia and the United Arab Emirates there is a powerful feeling of abandonment. In Israel, there is the bitter realization that America’s strongest ally in region is now made to look like the final holdout against a blissful era of compromise that will calm a turbulent region. A sound U.S. diplomatic course with Iran would never have run so far ahead of Israel’s interests and of the region’s moderate anti-Iranian Arab coalition. In Washington, the threats represented by Tehran’s theocrats are forgotten in this time of undue optimism, as is the Assad regime’s continued barbarity. With the Russian-brokered “deal” on Syria’s chemical weapons, Mr. Obama has merely draped American abdication in the garb of reason and prudence. Those who run the Islamic Republic of Iran and its nuclear program, like most others in the region, have taken the full measure of this American president. They sense his desperate need for a victory—or anything that can be passed off as one. Will the nuclear negotiations with Iran usher in a new era of comity or just embolden a determined enemy to keep up its war against us?